Introduce your grandchildren to another classic, the treasure hunt for kids. Here's how it works. Well ahead of time, the adult writes down clues, then distributes them so that one clue leads to another, culminating in some "treasure" at the end. Then the fun begins! If the children are old enough, they read the clues. The grandparent helps with hard words and gives extra clues if necessary. The treasure hunt is especially fun with school-age kids who can read the clues themselves, though they may occasionally need help. With a lot of grandchildren on hand, the treasure hunt is likely to turn into a mad dash. With a single grandchild, it will be more leisurely. 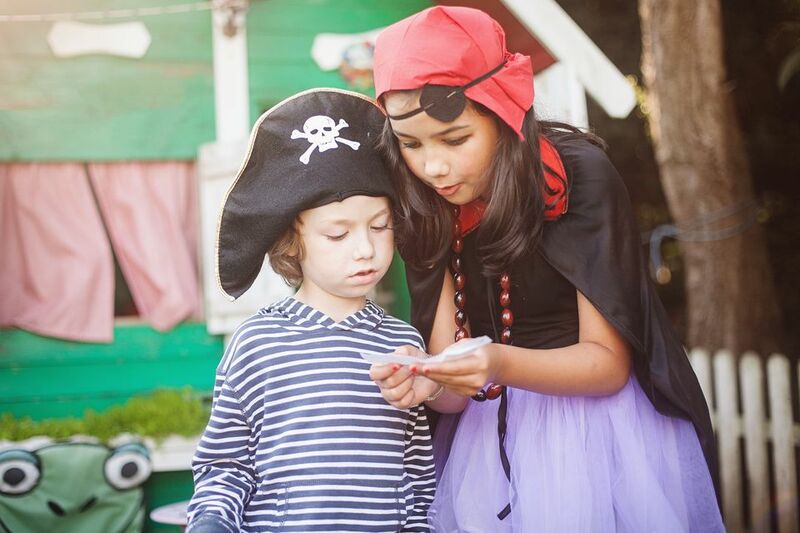 With multiple grandchildren, you'll want to make them take turns reading the clues and be sure to provide enough "treasure" for each child at the end. Treasure hunt clues are more fun if they require a bit of solving. Puns and rhymes add to the fun. I've created 30 clues to get you started, all involving common outdoor objects. You can copy and paste these to save time. Answers are at the end. You can also use these as a starting point to create your list, customized for your outdoor environment. I'm a friend to parents who like things neat. They really like it when you wipe your feet. I give privacy from the folks next door. If you have bad neighbors, you need me more. Everyone loves me. I'm pretty and smell sweet. Look down to find me! I'm near your feet. I swing out and in to let you through. I sometimes creak, and that's your last clue. On me, you can speed like a bird in the sky. My two wheels will make you fly! I sit very still when I don't have a rider. Sit down and learn why I'm called a glider. I have a ring, but you can't wear it. Sometimes so loud that you can't bear it. I'm sort of like sneakers, but for a car. I help it run really fast and far. In day I store the light of the sun. At night I shine when the day is done. I'm like a small house, but no one lives in me. Tools and gadgets are all you will see. I'm a giant piece of petrified matter. If you dropped me, I'd make quite a clatter. But without me for your trash, you'd be out of luck! I might be filled by male or female. Whichever it is, I'm still the mail. Use me to give thirsty plants a drink. Or use me to clean your car, fast as a wink. Turn me to the left, and you just might get wet. I'm great for giving a drink to your pet. I make music for you when you're out in the yard. I make the most music when the wind blows hard. For fine feathered friends, I'm quite a treat. A spot to raise babies just can't be beat. Climbing me can be quite a lark. I'm not a dog, but I do have a bark. I make lots of smoke when I get hot. I make yummy food that you'll like a lot. Hopscotch and skating fit me to a tee. Don't walk on the grass. Just walk on me! I make your job a little less hard. I move dirt and other stuff around the yard. I measure all the power you use. I hope your bill isn't bad news! I'm full of water, but don't take a sip. I'm for feathered friends who want a dip. I'm full of special smells, especially in the spring. Use me to give your food some zing! With my pointy hat and my long white beard. When it's chilly outside, I can't be beat. Light me up and then make a toasty treat. Fill me with seed and hang me high. I'll bring visitors down from the sky. Although it can be tricky to get in and out. At night I'm turned on to show you the way. Delivery services look for me. Make sure I'm placed where I'm easy to see. Choose the clues that fit the features of your outdoor space, or write your own clues. Don't forget the treasure that goes at the end. You can use a jar of coins for the grandkids to divide or fill a box with pirate "treasure" that you can find at the dollar store. The box can also be filled with inexpensive toys such as bouncy balls, bubbles, silly string or yo-yos. It's best not to use candy or treats because the ants are likely to find them first. In summer I like to put a big tub of water balloons at the end, but be sure the kids are in their play clothes because water balloons are irresistible! After your treasure hunt, you might want to play some classic outdoor games, toss a ball around or have fun with things that fly. If the weather is not favorable, you can also do a treasure hunt indoors.